Dear friends, your support in needed! 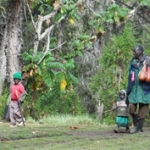 The Sengwer people – an indigenous hunter-gatherer community in the Cherangany hills in Kenya- is being forcibly evicted from its territory. Many of us have been following closely the story, as recent as last January, but is something that has been taking place since the year 2007. These evictions are directly linked to the World Bank’s funding of the Kenyan government’s REDD+ ‘readiness’ , through the bank’s Natural Resource Management Project (NRMP). The Sengwer people are being falsely accused by the Kenyan government of being ‘squatters’ in their own ancestral land and also of being behind the destruction of the forests in the Cherangany hills, which is a complete lie. The government of Kenya claims that evicting the Sengwer people will help in the conservation of the area but in reality is nothing more than an opportunity for interested parties to profit monetarily. More importantly, this grim situation presents an opportunity for those of us who are completely opposed to false solutions to climate change in the form of market mechanisms such as REDD+ to denounce the financialization of nature and to demand that we implement the real solutions to the climate crisis such as moving away from fossil fuel use. WRM together with the No REDD in Africa Network (NRAN) and several partners, have written a letter condemning these evictions. Deadline is Monday 3rd March, 4pm Nairobi time. Please spread the message. Please also send to other groups.